Have you ever watched a football game where team “A” is destroying team “B” and late in the 4th quarter, with time running out, team “A” drives down the field and gets inside the opponents 5 yard line and there is still a little time left in the game. What does team “A” do? If it is a team coached by Nick Saban then they call time out and try and get one more touchdown but if team “A” is coached by someone else then they run out the clock and the quarterback ‘takes a knee’ (kneeling to signal the play over but allowing the clock to run out). 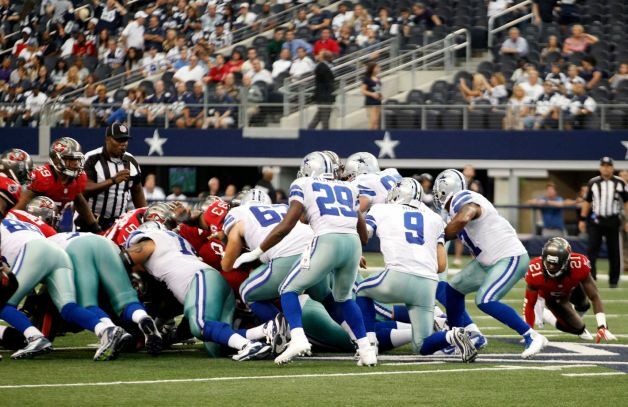 Some people think taking a knee is wrong, especially in the NFL, and that you should play hard until time runs out because it is up to the other team to stop you. While I agree with that somewhat, I feel that taking a knee at the end of the game is even more demoralizing to the losing team than if you tried to run up the score with another touchdown. The message the winning team is sending to the losing team is that the level of competition was so lopsided that the winning team is taking pity on the losing team. The winning team is telling the losing team (and their fans) that they could’ve scored again but took sympathy on the other team because they were beneath their level. That is exactly what Romney did to Obama during the 3rd debate this week. Romney knew the Benghazi debacle would continue to fester and he didn’t need to attack Obama on this. By Romney allowing those who still consider themselves journalists (like the Reuters article) to do the heavy lifting on Benghazi-gate, Romney sent the message that he knows victory is certain and instead of running up the score, he decided to show pity on Obama. Obama was left looking petulant and trying to score points with zingers that later turned into duds while Romney appeared presidential and was seen as the adult at the table offering solutions to problems. Do you need proof that Romney should be confident of victory? Look no further than this recent poll in the swing state of Ohio. This poll has Obama leading Romney in Ohio 49% to 44% but, as always with these polls, we need to dive deeper. You’ll see from the partisanship columns that those who identify with Democrats are 37% (273/742) and those who identify with Republican are 28% (206/742) so this poll has a D+9 sampling bias. Ohio is a true swing state and if you think the characteristic of a swing state is a 9 percentage point advantage to one party then you are sadly mistaken. Obama won the 2008 presidential election in Ohio by only 4.5 percentage points and that was with a totally different political climate than we have in 2012. To think that the D/R advantage in Ohio would be twice what it was in 2008 is wishful thinking for Leftists. 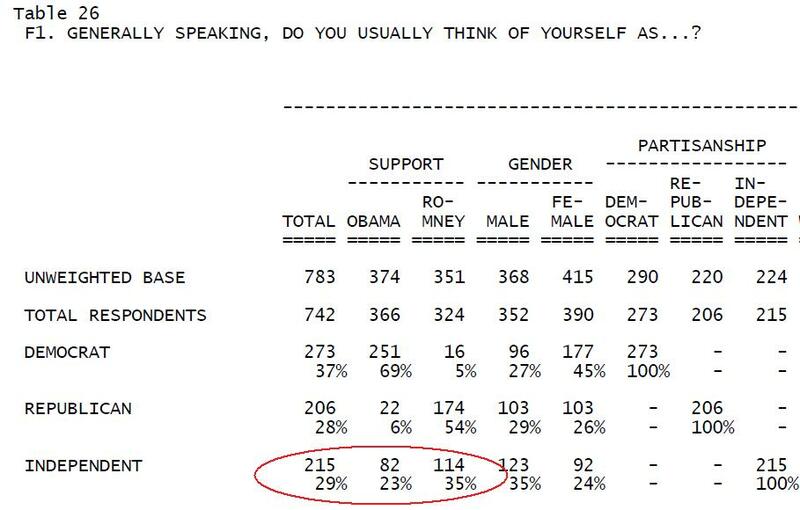 Another part of the Time poll shows independents moving overwhelmingly in favor of Romney. Ohio Independents are favoring Romney over Obama 35% to 23% and this is huge in a swing state. Romney has to be privy to internal polls that show this same swing in Ohio and this is my guess as to why Romney was so confident in the 3rd debate and backed off on attacking Obama on Benghazi. Without Ohio, Obama doesn’t have a chance to win a 2nd term and if you look deeply into this latest poll you can understand why Romney took a knee. Two more weeks and this Obama nightmare will be over. The real issue in Ohio is turnout. Unlike a lot of states, there really is organized labor in Ohio. Obama has concentrated on a get out the vote/early voting program in Ohio for the last four years. Most observers say the Democrats have the superior ground game in the state. There has been a late surge for Romney but whether that will make up for the Democratic gains in early voting is unknown. One could argue that early voting is mostly done by the already committed base on both sides and that these voters were unlikely to change their votes. However, if early voting raises the turnout of the Democratic base, that could be bad for Romney. Romney needs a lower Democratic turnout from the discouraged and disappointed who voted for Obama four years ago. It’s still a squeaker unless Romney can win an unexpected state like PA, or MI. Another sports analogy would be that the last debate was round three of a boxing match and Romney, having scored two knockdowns in the first round and a draw in the second, decided to clench for most of the third round to avoid any chance of being knocked out. It was a smart strategy by a smart man. I was rooting for a knockout on Benghazi but Romney still needs young women to support him. Many are worried about a Republican propensity to call for the use of force. Romney took a very neocon view in the primaries and needed to walk back from those positions. He could not risk alienating women by brawling with the president and foreign affairs. By hugging Obama on the “Peace” issues, Romney had a better chance of persuading undecided women he needs to view him as a “safe” alternative to Obama. It wouldn’t surprise me if the statement, “We can’t kill our way out of this mess.” was a focus group tested phrase that scored high with undecided women. It’s unlikely this was a spontaneous statement. Very smart positioning. It’s not who wins each debate that is important, the only thing that matters is winning the election. Romney’s performance has been outstanding in the fourth quarter after being behind in the first three. No question he has the momentum but he can’t afford to take any more knees. He needs to pull out all the stops to get out his vote. I think he leads by a field goal or less. He could still loose by winning the popular vote and loosing the electoral college. Thank as always Blaine for your valuable input to the conversation. You’ve been all over Ohio from the begining and pointing out how crucial that state is and how close it is. I can’t imagine that Ohio will end up with a D+9 voting margin on November 6th so based on the above mentioned poll, I think Romney has a fighting chance. That is a great point you make in your other comment about the number of field offices. Having a strong groud game is crucial and Ohio does have a big union population. One more sobering statistic. Obama has 122 local campaign headquarters in Ohio. Romney has 40. It’s possible Romney could win without Ohio but he would have to win WI and NH, as well as FL, NC, VA, CO and Az. Of course if he wins PA or MI, he will win easily and both states are in play. But Ohio is a true toss up. This is going to come down to the wire.